Our WooCommerce Social Login plugin has quickly become one of my favorites, as you can allow users to easily link social accounts to WooCommerce and Sensei. This makes it easier to get involved with your store and far easier to save a user profile for future purchases. WooCommerce social login buttons are also always displayed to logged-in users on the “My Account” page so that they can link social accounts to existing accounts for fast, easy sign in. However, there are some handy templates tags in the plugin as well that can help you display WooCommerce Social Login buttons wherever you’d like. Let’s take a look at a few use cases for each of these. Note that these are advanced uses / customizations that we don’t offer support for, so you should be familiar with basic WordPress / PHP development. While most shops want to use WooCommerce Social Login to encourage new users to make an account quickly and securely, some shops like to use this for customers (logged-in users) only. 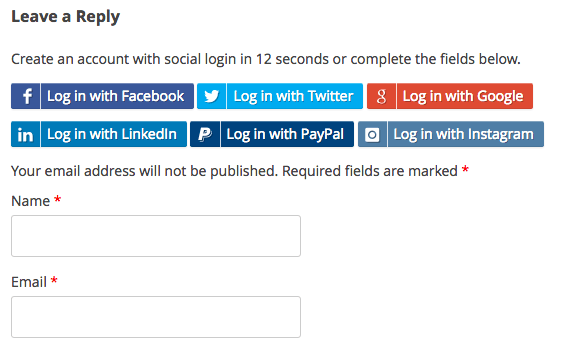 The issue here is that WooCommerce social login buttons are hidden by default to logged in users. This will display “Link your account” buttons to logged-in users where used, and will show nothing to non logged-in users. Rather than use a template tag, I’d prefer to use a shortcode so I don’t have to edit my theme. Let’s turn this into a shortcode that will display a message to non-logged in users, but show buttons for logged in users. If you’re not sure where to create this code, I recommend using the Code Snippets plugin as described here. If you’re preventing non-logged in users from linking social accounts, don’t forget to create settings that reflect this. Remove all social login buttons from the checkout, “My Account”, etc. You could even use your new shortcode instead. Now let’s use it! Add your new shortcode to a page, post, or text widget (if using our tip above). WooCommerce Social Login has a built in widget to display social login buttons, as well as a shortcode to do so: [woocommerce_social_login_buttons]. However, the widget and shortcode will display nothing to logged in users. Again, this is because we don’t want to distract customers with shiny things until they purchase 🙂 . If we’re in the same situation as above where want logged in users to link an account, we can use the above shortcode. However, if you’re okay with showing the login buttons to non-logged in users as well, we can make this easier. Let’s create a super shortcode (that I can also use in a text widget) that will show login buttons for non-logged in users, and “Link Account” buttons for logged in users. I’ll do something similar to the snippet above, but replace what happens for non-logged in viewers with the button display instead. This will create a [wc_social_login_all_buttons] shortcode for me, as these functions already pay attention to whether the user is logged in or not and I don’t have to specify this. What if you have forums or comment forms on your posts, pages, or protected content? 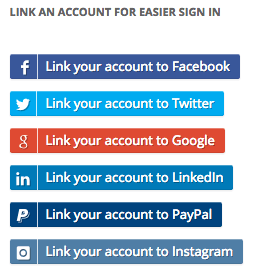 You may want to add social login buttons here to encourage members to either sign in with a social account or perhaps link a social account. We can do both! 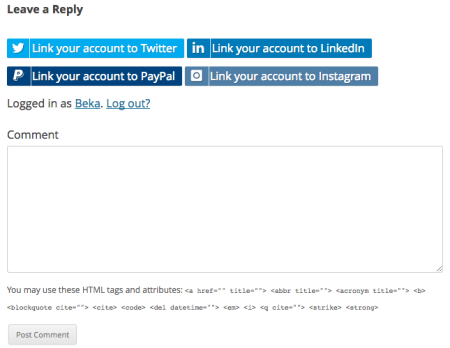 The first function adds WooCommerce social login buttons to the comment form. Remember, these functions already pay attention to whether or not a user is logged in so we don’t have to duplicate this conditional check. You can use the first part to display buttons to non logged-in users, and optionally use the second part to show “Link account” buttons to logged-in users. We don’t want to use this on our comment form, so we can use the super-handy pre-option filter built into WordPress to adjust this. The second part of our code snippet uses this to change the option before the plugin retrieves it, depending on which page we’re on. The if() check in the beginning of this function checks to see if we’re in the admin or on a WooCommerce page, as we don’t want to modify the text there. If we’re not, then it changes the text to whatever you enter. Notice that the text above our social login buttons has changed based on our snippet, but this won’t change on WooCommerce pages. Again, the “Link Account” buttons are optional here. If you don’t want them, you can remove the woocommerce_social_login_link_account_buttons(); part of the snippet. You can even see this in action in our comments section. The last place you may want to add these buttons is to the /wp-login.php pages. 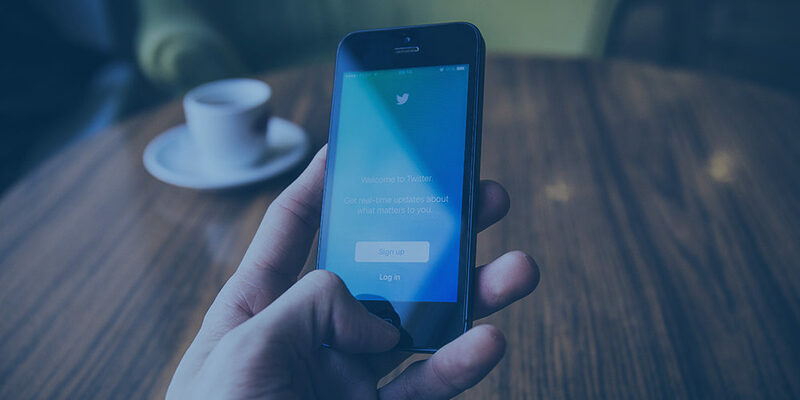 This may be handy if you’d like to link your social account as an administrator, allow shop managers to do so, or allow linking aside from the WooCommerce login. You’ll add it in pretty much the same way we added buttons to the comment forms. We’d love to hear about it if you use any of these tips in your shop! Drop us a line in the comments 🙂 . Great post, so many useful snippets, bookmarked for our customers! Awesome 🙂 . Thanks for reading! Hey Alessandro, glad you’ve found them useful! It’s actually good to hear they’re not included in the WooCommerce support channel, as it’s fairly impossible for us to include custom code as part of support for hundreds of thousands of sites. Including it in a ticket gives the indication that we’ll customize it as needed or update it, so we prefer to leave tips like this in tutorials where it’s clear that it’s an advanced / developer tweak 🙂 . As for the CSS, we have an update coming out today or tomorrow that should fix this display issue! You can get rid of the extra CSS once you’ve updated. I had a quick question about this. Can the plugin also pull user’s profile pic from their social profile? and can it be displayed on their “My account” page? Hi Puneet, it does pull the profile picture (if available – details here) and this will be used as the avatar picture. It won’t automatically be added to the WooCommerce “My Account” page, as profile pictures are not shown here by default, but you could add it via custom code if desired. I’m wondering how can I change the “Click here to login” text in the check out notice? Would be nice to have this option in the dashboard somewhere. Hey Jose, glad to hear it’s working out for you 🙂 . You could translate the text using the Say What plugin — the text domain is woocommerce-social-login. Cheers! I’m trying to add WooCommerce Social Login to my review and comment forms. I followed the section “Add WooCommerce Social Login to Comments” inside the “Code Snippets” plugin but it does not seem to be working. Am I doing something wrong? Hey Phelipe, after you save the snippet, do you then activate it? The comment form action we’re using is in WordPress core, so it should work with most themes. I did activate it, and my theme does accept Code Snippets… but I do not see the WooCommerce Social Login for none logged in users, only for logged in users to link their accounts. Any help is appreciated. PS: I would like the same feature for product reviews. I have same issues of Phelipe Peres. Have you any solution? Thanks a lot for the great tips on your blog. I’m trying to change the return URL after logging in with social media but I’m having a hard time figuring out. I guess it should be a simple task but I can’t get it right! Afraid that filter isn’t present, which is why this code isn’t working 🙁 . I’d recommend using the shortcodes instead of automatically displaying login buttons to manually set this, as they have a return_url attribute — more info here. Hi Beka, Thanks for the Say What plug in it works great. I have 2 questions if you could help. 1: How can I make social login button open in new page or a pop up? We’d definitely be happy to help out with this! Do you have a support ticket submitted already? If you can respond with the 6-digit ticket number, I can make sure we grab it right away. You can also submit it here. Thanks! Sorry I did submit a ticket with woo themes about this but I just now see they responded to me last month about it. So I dont know if its still open or not. I was able to apply login buttons to Post comments, though these buttons wont appear in woocommerce product review tab. How can I add them there? Hey Marcus, I’m afraid that product reviews do not add comments the same way that standard WP comments are added, so the action used here won’t exist in product reviews (this is instead a custom form created by WooCommerce). I’d recommend looking into review templates to add the social login template tag instead. Great customization tips! I’m really considering to add these functionality to one of my projects. Anyway, I’m working on a new website which brings a custom “My Account” page template. How could I move the Social Login linking options to a specific section within my page template after the user is logged in? I mean, would it be possible to achieve this without having the options for linking social accounts duplicated? I ask because by viewing the plugin’s screenshots it seems it follows woocommerce default templating. The account linking template is hooked into the woocommerce_before_my_account action, so you could unhook it and re-add elsewhere in the my account template if desired. Thanks a lot! I’m checking now the plugin’s Developer Docs. Please help me! I want to logged in automatically to my website if customers already have account on my website and linked social network when they logged in to these social network websites in other tab. I have successfully got the facebook login button on to the Account Page but I want it on the right hand side, where the register new user usually goes. How do i do this? I’m still getting familiar with functions, actions and hooks. This is not working can you please let me know the correct hook / code to use? I’m sure this isn’t correct. I knew I didn’t forget its just not displaying because opening / closing brackets. I’m having a hard time figuring out. How do I let my users return to the current page or referer page after login in? Hi Beka, are you going to add more services to this plugin like VKontakt, yahoo and such? Beka, it’d be cool if SkyVerge could jump in here and help here, but I’m gonna figure this one out one way or another 🙂 ……. Scope: Use Social Login (along with some “compelling CTA”) to capture email addresses to be used for abandoned cart, remarketing, and email follow up purposes. 4.) Store email address as a value that can be used for abandoned cart, follow up emails, or anything else. Beka, have you Max or anyone else ever thought about tackling this? Hey Brad, You could add your text with a ! is_user_logged_in() check by overriding the /global/social-login.php template, which renders the buttons. As for opting into email correspondence, this would be a bit tougher to do since the email would then have to be passed to whatever the customer is opting into (plugins or external services), which would require integration for each service / plugin. I think for most stores, creating an account typically gives you permission to send abandoned cart or follow up emails (i.e. you don’t opt into order update emails, right? ), so I wouldn’t worry as much about getting the opt in for “lifecycle” emails like this. I’d just get permission for other emails, such as marketing / promotion emails, which perhaps you could do with a welcome email hooked into the woocommerce_created_customer action. Another solution would be to automatically subscribe new customers to MailChimp, then send an email from MailChimp asking them to opt into your marketing groups / segment by updating their profile / preferences. We are working on the abandoned cart problem for sure 🙂 Our Jilt app is very close to integrating with WooCommerce, which would automatically use the stored email for logged in customers to send emails (or try to capture one for guest customers if not). WooCommerce Social Login plugin doesn’t allow to connect a social network account if that account uses the same e-mail address. This applies when a WordPress user with same e-mail address is already exist. I couldn’t connect my Facebook and Google accounts, but I could add another Google account which has a different e-mail address then the one which already exists in WP user database. So (1) you have a WP account with a linked social account (2) you try to “log in” with another social account and it doesn’t automatically link them. This correct? Sounds like you’re doing this from your admin / shop manager account, which is expected behavior. 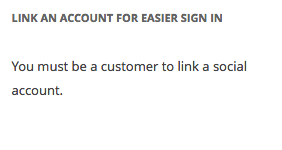 If you log in, then link the account via “My Account”, you’ll be fine. This won’t happen for your customers, as logging in with a social account that uses the same email as the site account will link them automatically. The reason why is a bit detailed, so I’ve added it to the plugin docs here. Yup, that’s exactly what happened. After reading the link with docs you attached it makes more sense. Awesome post have been searching for it for a while, just purchased the plugin, am trying to set up on my homepage so new users can login with their social login, but they should be redirected back to the homepage after login, i will like the login form to popup when users click the my-account link, how do i make that happen? This should happen already if put on the homepage via shortcode. If not, we’d be happy to help out via the help desk! i will like the login form to popup when users click the my-account link, how do i make that happen? You’d need custom code around creating a modal window / iframe for this, as it’s not something the plugin will do itself. Hi Beka, Can you please update me? 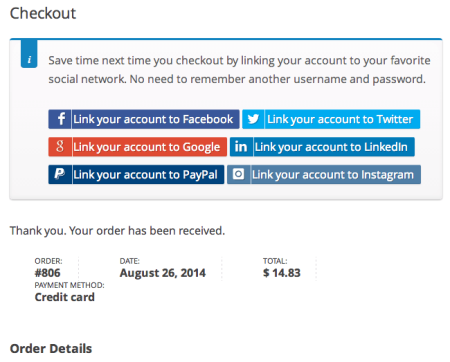 will woocommerce lightbox plugin be able to display social login as a popup? if that is possible, i will appreciate a response very much or any other suggestion. I also think you should do a course like this advanced social login tutorial, on social popup login, its being used by at least 50% of websites, Regards. As I’d said in my original message, triggering a modal / pop up with a my account link would need to be a customization. There’s not a reliable way to do this in a tutorial; would it use an iframe with a lightbox? If so, which lightbox (as there are several lightbox scripts)? Would it use a custom modal instead if not? That would require a lot of code around creating the modal and logging in via the modal, which isn’t easy. Should it have regular log in fields or only log in buttons? You’d need to have a developer implement the best solution for your site’s needs. This isn’t something we’d add to the Social Login plugin, as it supports a pretty simple workflow by outputting buttons directly with the shortcode already. Instead of outputting an account link and trying to do a pop up login workflow to show login buttons, I’d recommend outputting the buttons directly with the shortcode. This plugin seems to work well but the style options are limited. Is there an easy way to get the social media links to align vertically rather than horizontally, or just to display the icons? With the links all being different sizes, it can look a little messy. Hi Beka, thx for this great tutorial. I could make use of a lot of thinking inside it. I got a problem I would like to ask you about. It happens that I gave access to our bakeries web store to registered customers only and I wonder how to move the social buttons on top of the registration form rather than on the bottom of it. I managed to include a snippet in my functions that actually display a text message for not logged in users that says they would have to login. But I still have the normal login above the socials whereas it would be better the other way round. Do you have any idea? Saludos! Has anyone been successful using this plugin inside a lightbox/popup/iframe? We’re using AppPresser for our mobile apps, which is basically a button-less browser, and if somebody doesn’t remember their social credentials they end up getting stuck if they are using an iPhone without a back button. Hi.. Loving the WP Login Pages function. However how can I move the Social button UNDER the WP log in button. Kinda in the wrong place right now (between WP password and WP button). Yep! This is what the “Checkout” location setting does. I have a problem, when i try to login with user rol administrator or super admin, the social login not works. Can you provide please a hook? Thank you in advanced and great tips for woo social login! Hey Stephan, please test this as a customer role, as administrator-type roles do not automatically link accounts for security reasons.